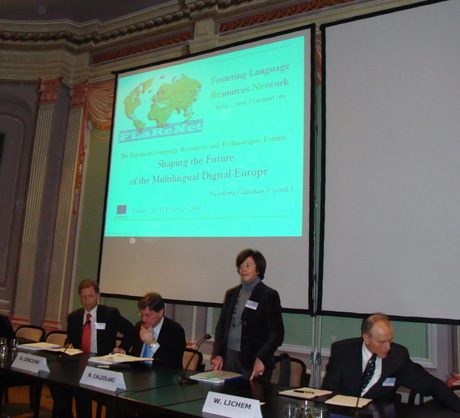 The launching event of FLaReNet - Fostering Language Resources Network - was held in Vienna, 12-13 February 2009, as 'The European Language Resources and Technologies Forum'. This event combined the FLaReNet themes with the i2010 objectives to address some of the technological, market and policy challenges to be faced in a multilingual digital Europe. The forum represented an important opportunity to identify the grounds for future directions in Language Resources and Technology at the level of the EC, national governmental agencies and industry. The new EC eContentPlus Thematic Network (ECP-2007-LANG-617001) FLaReNet - Fostering Language Resources Network - aims at developing a common vision in the field of Language Resources (LRs) and Language Technologies (LTs) and fostering a European strategy for consolidating this area. The goal is to enhance competitiveness both in the EU and worldwide. Nicoletta Calzolari opens the FLaReNeT Vienna Forum. The growth of the field should be complemented by a common effort that identifies synergies and overcomes fragmentation. By creating consensus among major players in the field, the mission of FLaReNet is to identify priorities as well as short, medium and long-term strategic objectives and provide consensual recommendations in the form of a plan of action for the EC, national organizations and industry. Through the exploitation of new collaborative modalities as well as workshops and meetings, the FLaReNet Network will sustain international cooperation and (re)create a broad-based Language Technology community. Anyone interested in these areas can subscribe to the FLaReNet website, join any of the working groups and participate in their activities. This will offer the advantage of playing a role in the definition of recommendations for future actions, thus shaping the future with respect to the new challenges. The Forum was composed of a series of working sessions in which leading experts presented their visions on hot topics in the field of Language Resources and Technologies. In order to elicit new ideas and perspectives from the widest possible audience, a contest for the best contribution was held and the winner invited to give a presentation in the evaluation session. In all the sessions, discussants and participants actively contributed to the discussion and the current debate about priorities in the sector. The final session was dedicated to a round table on international cooperation, mainly with non-European participants. Future policy and priorities were discussed in a global context, and the aim was to initiate a strategic discussion on the utility of promoting international cooperation among initiatives and communities around the world. All position papers and slides can be found on the FLaReNeT Web site. Proceedings of the event with reports on the outcomes of the various sessions, main trends and challenges will be available soon. FLaReNet is bringing together leading experts from many research institutions, academies, companies, consortia, associations, funding agencies, and European and international public and private bodies. In order to initiate the process of establishing a stakeholders' platform that is as pervasive as possible, the FLaReNet steering committee is inviting all interested players in the field to express their interest in becoming part of the network. To do this, fill in the form available on the project Web site. In the meantime, stay tuned for the first issue of the FLaReNet newsletter. This is a means by which the network can reach the outside community and reinforce links between network subscribers. The first issue will focus on the FLaReNet launching event, featuring a report on the event as well as interviews with the invited speakers.